For over 40 years Green Markets is the trusted source for fertilizer market data. Find out why fertilizer manufacturers and aligned industry professionals from around the world say Green Markets is absolutely critical to their business processes. Green Markets gives you instant web access to time-sensitive fertilizer market intelligence, including more than 350 trusted and independent price assessments on 26 different fertilizer commodities. Each weekly issue includes local market reports for ammonia, urea, and other nitrogens, phosphates, potassiums, sulfurs and blends. On-going news coverage delivers insight on industry management moves, updates on alliances, mergers and consolidations and much more. Single user subscriptions start at US $2,005. Still not convinced? 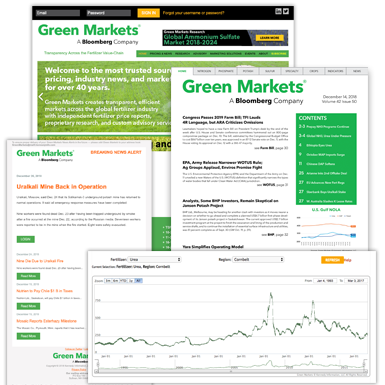 Download a free sample issue or contact Lisa Robel at +1.603.357.8181 (lrobel@green-markets.com) to see how Green Markets informs your business for higher profitability. Interactive Price Chart — View the fertilizer prices that are critical to your business across a time series of your choice. You’ll select from any combination of fertilizer, region and date range to analyze current price movements in context with historical patterns and significant market events. Green Markets U.S. Weekly Fertilizer Price Index — Your proprietary benchmark to gauge the relative strength of U.S. fertilizer prices gives you remarkable clarity on the market’s dynamics. Do you have more than one person in your organization, or more than one office that would like to receive Green Markets? Contact Lisa Robel at lrobel@green-markets.com or call 1.603.357.8160 for custom licensing solutions that will keep your organization in compliance with U.S. Copyright Laws.